Switch Stacking vs Uplink: Which is Better for Connecting Switches? Networks will eventually grow to the point that more switches should be integrated to increase port density and boost bandwidth. Then, should I buy switches with more ports or just connecting switch via stacking or uplink. Obviously, the latter makes more sense. Switch stacking vs uplink – is there any difference between them? 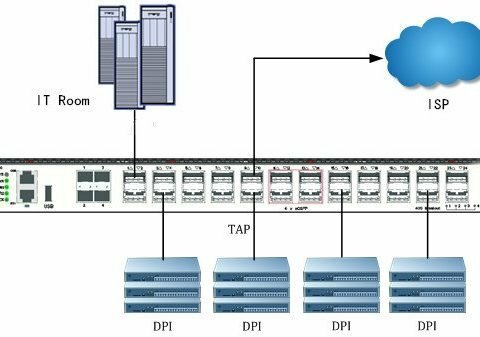 In which case we should choose switch stacking over uplink switch? This article tries to shed some light on the pros and cons of switch stacking vs uplink, and help you to make the right decision. What is a Switch Stacking? Let’s start from switch stacking. By stacking switches together, you are allowed to manage multiple switches as a single entity, but with typically increased bandwidth between switches. Switch stacking can be done by connecting switch backplane via a stacking cable – it is a cable specified for stacking switch that comes with the switch. Staking switch makes it very convenient and easy to configure multiple switches from a single console – stacking can be seen as a single entity, you manage one device rather than each stack member, and to manage several stacking switches with only one IP address. Which significantly enhances network efficiency while simplifies management. Generally, a stackable switch has a dedicated port for stacking via special cable or module, which brings higher costs. 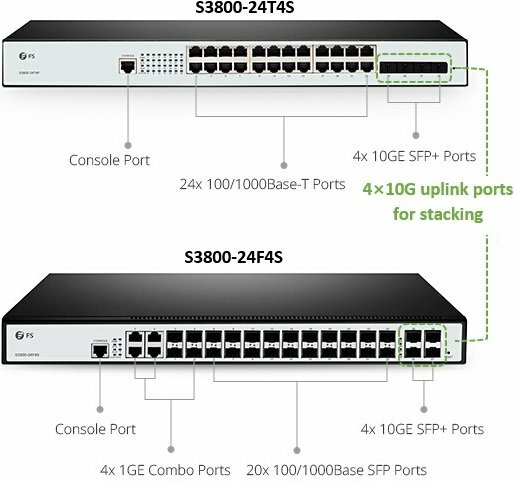 However, some stack-capable switches are embedded with some uplink ports for stacking to minimize the cost, like this FS Gigabit stackable managed switch (S3800-24T4S) and gigabit stackable SFP managed switch (S3800-24F4S). 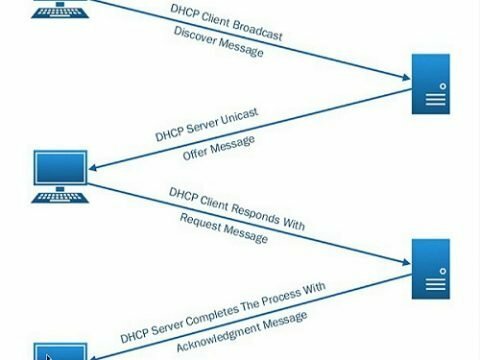 What Is Uplink Port on Network Switch? An uplink port is a port on which transmit and receive are reversed, which is designed for inner-switch connection with a standard straight-through cable. Otherwise, it would require a crossover cable where the transmit and receive are crossed in the cable rather than on the switch port. Plug the uplink port of one switch, for example, into the standard port of another switch cab help expand the network’s size. When connecting two devices, the uplink port on only one of them is used. If you connect two uplink ports with straight-through cable, the result is the same as using two conventional ports – makes the devices fail to communicate. Switch Stacking vs Uplink: How to Choose? Some may still hesitate when choosing switch stacking vs uplink. Simply put it, switch stacking is a great fit for limited space deployment where flexibility trumps availability. Being a pay-as-you-grow model, switch stacking is attractive for users that need flexibility in their physical network and in the amount of needed traffic. It gives you the resilience to operate them as a part of a stack today, or as individual switch tomorrow. Besides, stacking offers more bandwidth while simplifies network management, proven as a more cost-effective alternative to chassis-based higher-end switches. However, stacking is only for the stackable switch in the same product family of the same vendor, and the connecting distance is limited by the length of stacking cable – often within wiring closet. Switch uplink not only relieves you from having to use a crossover cable between two standard Ethernet ports. It also offers a perfect fit for connecting switches from different product family or even different vendor, enabling much more flexibility to your infrastructure. Moreover, leveraging the standard Cat5e/Cat6 cable, switch uplink extends the linking distance up to 100 m. If your switches are located over 100 m, you can put another switch in between as the bridge. Compared switch stacking vs uplink, switch uplink only provides very limited bandwidth increase. In some cases, users can benefit from using both switch stacking and uplink. Switch stacking vs uplink, as two critical methods to increase switch ports, has their own benefits and drawbacks. As always, the most important part is to determine what your requirements are. We have gone through both the pros and cons of switch stacking vs uplink, wish it may help you to make a valid decision for your network.